A moving car caught fire at Eastern Express Highway between Mulund and Vikhroli in Mumbai on Friday night. Mumbai: A moving car caught fire at Eastern Express Highway between Mulund and Vikhroli in Mumbai on Friday night. The driver of the car escaped unhurt. In a similar incident last year, a moving car had caught fire near Chakala (JB Nagar) Metro station in Andheri-east, Mumbai. No casualties were reported in the incident. The driver, however, suffered minor injuries. As per the eye-witnesses, a white Honda City on Andheri-Kurla Road caught fire while it was passing under the Chakala (JB Nagar) Metro Station. The cause of fire could not be ascertained. 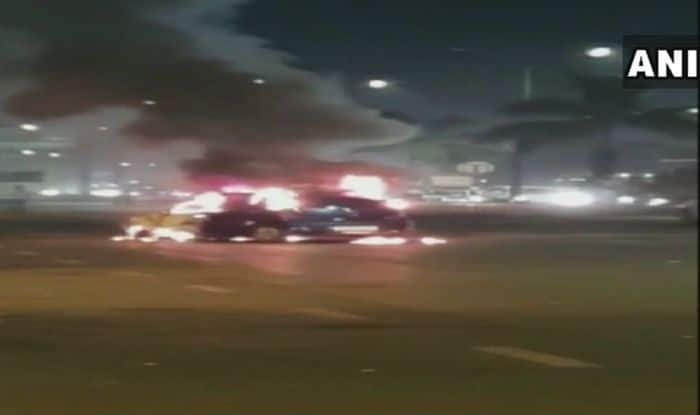 In December 2018, a 45-year-old engineer died after being trapped in his car when the vehicle caught fire in Greater Noida. The deceased was identified as Pavan, a native of Amba in Himachal Pradesh. A police officer said by the time they reached the spot near the DPS Society, under Kasna police station limits, the vehicle, a sedan, was already in flames and the body was later found inside. “The man was identified as Pavan, who was working in a private company here. He was returning after a night shift when the incident took place at 5.30 am. He was only half a kilometre short of reaching home,” police had said.